On this date in 1794, Nicolas Luckner was guillotined in Paris. A count with his own manor on the German-Danish frontier, Luckner (English Wikipedia entry | German, where he’s Nikolaus von Luckner) made the sort of cross-national career pivot that was still possible in the pre-revolutionary world by going from commanding hussars against France in the Seven Years’ War to serving in the Bourbon army. 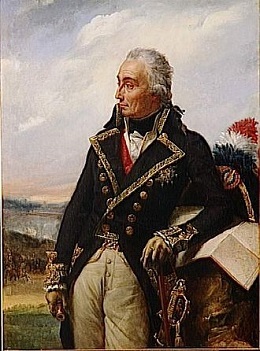 Allegedly convinced that Marie Antoinette had blocked his advancement, Luckner supported the French Revolution, and by 1791 had summited his profession as Marshal of France. This septuagenarian foreign count showed a lordly blindness to his adoptive country’s situation both fiscal and political by journeying to Paris later in 1793 to complain that his pension was not being funded in full. Other officers had already fallen under the Terror’s blade for command failure, where any shortcoming in the field could be readily conflated with treachery — and Luckner, no surprise, was soon denounced as a royalist. City hall in the small Bavarian town of Cham, where Luckner was born in 1722, still chimes the Marseillaise every day to honor its native son … whose name also associates with Germany’s World War I naval hero Felix von Luckner, the great grandson of our man Nicolas. * The Convention’s emissary on this occasion was Choderlos de Laclos … best known now (and then) as the author of the viperous epistolary novel of ancien regime misbehavior Les Liaisons Dangereuses.